Today you will learn simple and insightful techniques that you can do on a regular basis to raise your vibration and manifest abundance in your life. You’ve probably heard this before, but success in business is 80% mindset, 20% mechanics. So today, it’s all about the mindset and the concept of the Law of Attraction. Learn how your emotions can affect what you attract into your life and why you should focus on positive vibrations. Learn how you attract and manifest money, abundance, love and happiness. And how you can use these skills to attract the ideal customers into your business. It is a powerful concept and if used wisely, can benefit you. I will also will give you techniques on how to deliberately use the Law of Attraction to create a life that you want. And this includes, how to raise your vibration and how to “allow” things to manifest, so that you are more open to abundance. So we’ve heard it all before, but does the Law of Attraction really work? One thing that we need to remember is that the Law of Attraction isn’t just something that you do “deliberately” to attract what you want. We are always manifesting, even though we are not consciously aware of it. But it is important to be aware of what we are doing that attracts the things that we love, but also, what we are doing that attracts the things that we don’t want in our lives. In today’s blog, I will walk you through the 5 main techniques that I use myself to manifest abundance in my life. This is something that you can learn and refer to on a daily basis and TRY the techniques. See how it works for you! These techniques have worked so well in my life and it’s gotten me to where I am today. It’s given me abundance in all ways possible. From love, to business, to family… to owning a retreat center in paradise. So give it a go! Because you never know where this road will lead you and it will open up so many doors in all ways possible. And if you’re doubtful, just give it a go anyway! I have no doubt that this will change the way you think and the way you see the world. The Law of Attraction is a way of life. An empowered way of living. It is an understanding that we are all energy and we are not separate from anything or anyone. This includes people, physical objects or positive experiences. Nobel Prize winning physicists have now proven beyond doubt that the physical world is a collection of energy. Nothing is solid. Quantum Physicists have proven that thoughts are what builds and keeps together this ever-changing field of energy, into the objects that we see. And that the objects around us, isn’t the hard objects that we see, or touch. We are all a collection of energy that is moving in rapid rate. So instead of seeing flashes and swirls of energy… we are seeing the whole object. So let me give you an example. Do you remember, when we used to draw stick figures at the bottom corner of a notebook. And each page after that, was the same stick figure with it’s leg in a different position, and the page after that is another stick figure with his leg in another position? And when you grab all the edges and flick it rapidly, you see the stick figure running? Well that’s how energy works. It’s working in such a rapid rate, that our eyes can see the whole object, rather than the tiny packets of energy. Another example is our body. Our body is made up of tissues and organs, which is then made out of cells, which is made of molecules, then atoms, which is made up of sub-atomic particles, which is made of ENERGY! So, we as humans are one big balls of energy, that is walking around, ever changing. So since we are energy, everything around us is energy… and it is proven through quantum physics that the act of observing an object creates the object…. What does this for us? This means that whatever we think, we create. Like attracts like. What you focus on, you will attract more of into your life experience. For example, have you ever known someone who is always happy and attracting good things into their lives? People who are always happy and always seem to have good things happen to them? We may call them lucky… ? Well guess what? It’s not luck. It’s not the universe randomly providing them with abundance that happens to fall into their laps time and time again. They are using the Law of Attraction to attract it into their life. Whether this is consciously or subconsciously. The way they think and they way they feel, is one of abundance. Their most dominant thought, is one of abundance. Not of lack. So what about emotions and vibrations? We always hear that what we think, we attract. That also goes for feelings. To be honest, emotions are more powerful. What we think, we feel and what we feel we attract. Let’s talk about positive vibrations and how it can affect your life. Each of us, was born with a guidance system to help us through life. This guidance system, could be classified as your intuition, your gut feeling or how you feel emotionally. These emotions give out positive vibrations. When you feel sadness, anger, jealousy, bitterness or resentment… these emotions give out negative vibrations. So in order to attract the life that you want, and align yourself to open up the flow of abundance… whether it’s more happiness, love, money and successful business… we need to ensure that we are mindful of our vibrations, every moment of the day. And you can do this by, checking into what you are thinking and checking into what you are feeling. And if it’s not vibrating positively, we need to be aware that this needs to be raised. And I’ll show you some techniques on how to raise your vibration, so that you are emotionally aligned and consciously making that extra effort to attract what you want in your life. So be consciously aware of your own guidance system, and take responsibility for your life. Because when you do, through deliberate training and tuning into and aligning with positive frequencies, we can create infinite possibilities. We must also remember, that we are responsible for our life. We can create a great life for ourselves. We can have happiness. We can have anything that we want. But we need to work at it. We do need to put some effort into it. It takes work. We can’t just think and manifest. It does require work. But, if you align yourself to the universe and it’s endless supply of whatever it is that you want to create, it will speed up the process of delivery, when you are vibrationally matched. Ok, so if you want the Top 5 Law of Attraction hacks that can raise your vibration, so that you can deliberately and consciously manifest your desires? You can download it from here! 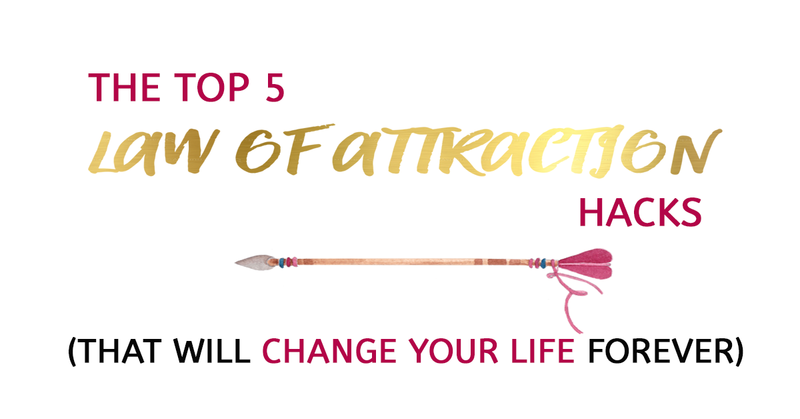 And check out the full episode of Wild Woman Run Free Episode 004: The Top 5 Law of Attraction Hacks (that will change your life forever). We would love to here your inspirational story on any Law of Attraction successes, so feel free to leave a comment below.